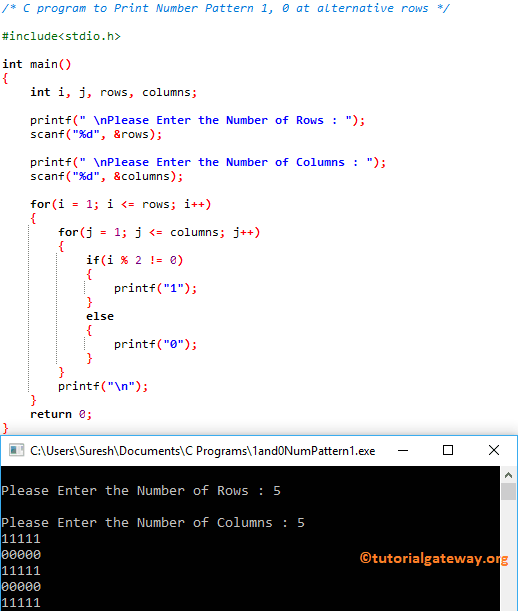 In this article we will show you, How to write a C Program to Print 1 and 0 in alternative rows with example. For this Number Pattern, we are going to use For Loop and While Loop. This program is same as first example, but this time we are using While loop (Just replacing For Loop with While Loop). I suggest you to refer While Loop to understand the loop Iteration. This program is same as first example, but this time we are performing i % 2 directly inside the printf statement. By this, you can avoid using If statement. This program is same as above example but we changed the printing. I mean, this program will print 0’s in Odd rows, and 1’s in Even rows.